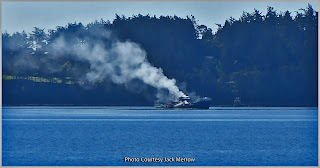 Oil-Electric: Before the Deadliest Catch: Part One - "Back-Story"
Before the Deadliest Catch: Part One - "Back-Story"
Derelict vessel burning in Penn Cove. Sank soon after this photo. 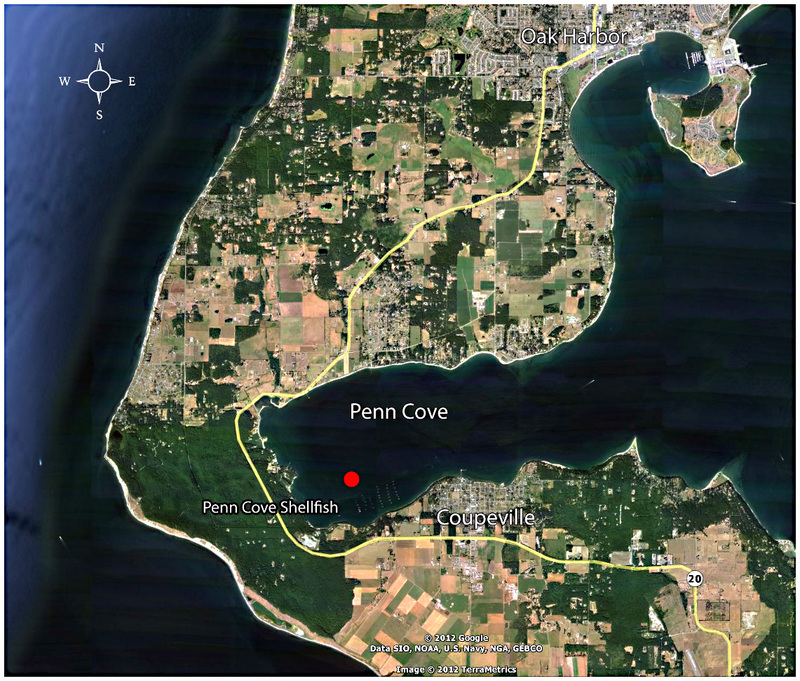 The next day the vessel sank within several hundred feet of renowned Penn Cove Shellfish. The derelict sank with an undetermined amount of diesel fuel and a cornucopia of dangerous liquids such a hydraulic fluid other harmful liquids into Penn Cove. 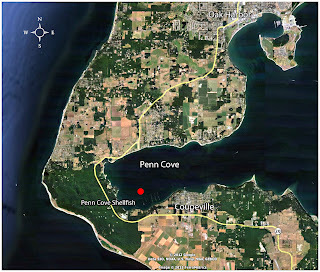 As you can imagine, management of Penn Cove Shellfish were wracked with fear and concern for their shellfish. And I was gobsmacked when I learned the vessels identity. The Deep Sea, which burned and sank in Penn Cove, was connected in a very small way to my family; specifically my Dad. 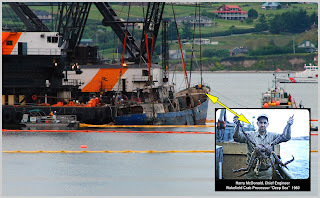 I am sure many of my readers are familiar with the Discovery Channels "Deadliest Catch." The reality program demonstrates - with visually powerful images - the dangers associated with today's Alaska King Crab fishery. The following story was written by Alice Myers Winther, Special Correspondent of The Christian Science Monitor. 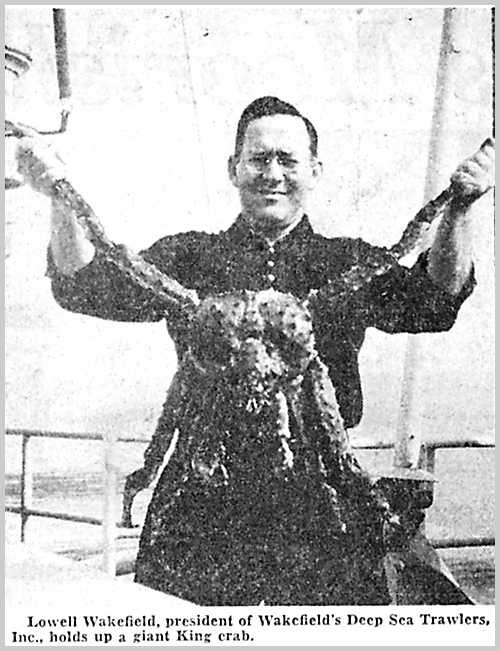 It was published on January 19, 1959, and sets the "back story" for my Dad's brief - but eventful adventure - in the Alaska King Crab fishery. Dateline SEATTLE: Dollarwise the King-crab industry in Alaska is still relatively small, grossing less than $6,000,000 a year. 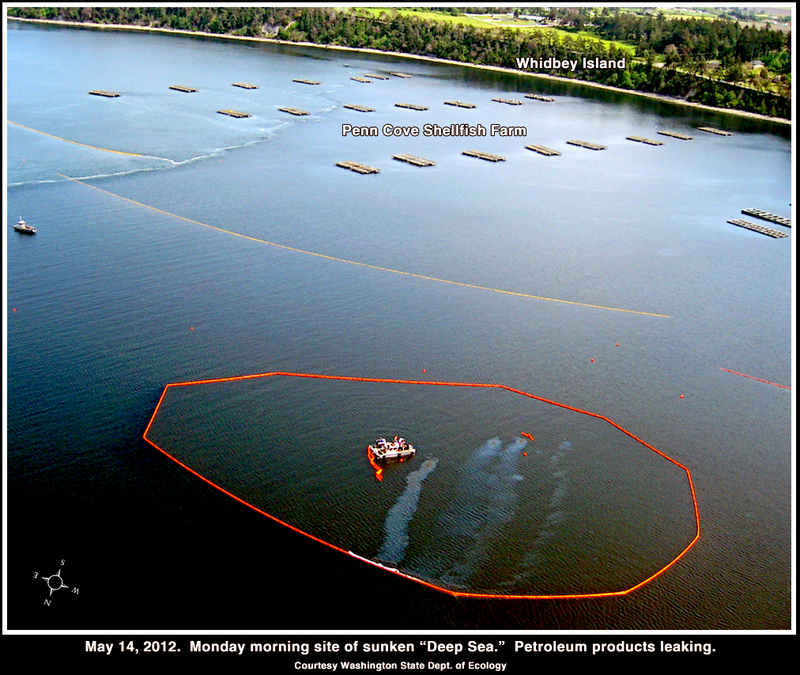 But its promising future spells hope of year-round employment for many Alaskan fishermen. "This," says Lowell Wakefield, pioneer in the industry, "is what makes our industry more important to the state of Alaska than its size would seem to warrant. Most of the companies going into the King-crab industry today are salmon companies who desire to develop employment for their men and boats during their off season. The crab season starts about when the salmon runs end in midsummer and carries through the winter until Apri1." King crabbing is a cold and often perilous occupation. It takes sturdy men and sturdy boats. The giant, six-legged crustacea inhabit the stormy waters off western Alaska and the lonely Aleutians. 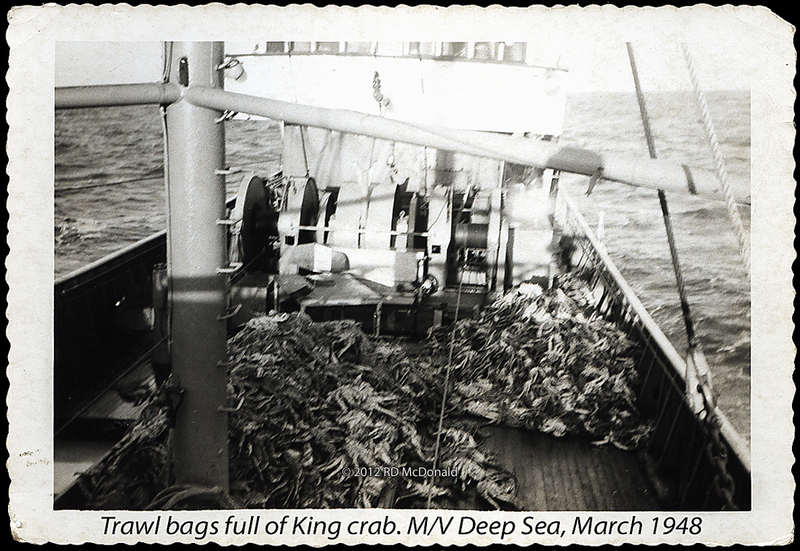 Lowell Wakefield, member of · one of Alaska's veteran herring fishing families, was the first North American to start catching and packing King crabs on a commercial scale. His company is still by far the largest in the industry, doing more than $3,000,000 of business in 1958. It's story, which we extracted from its tall, affable president between sessions of the International North Pacific Fisheries Commission, will no doubt be emulated by many another enterprising Alaskan as the nation's 50th state expands its economy. Mr. Wakefield was in Seattle recently as an adviser to the United States section of the three-nation commission which, in addition to work on salmon, halibut, and herring, is engaged in research on King crab in the Bering Sea, whence comes a goodly portion of the Wakefield catch. It was back in the late 1930's that Lowell Wakefield happened upon a seldom-encountered sight that altered his career and ultimately launched a new industry for Alaska. What an unusually low tide brought to view was a great pyramid-·or "hay stack"-of hundreds of King crab. 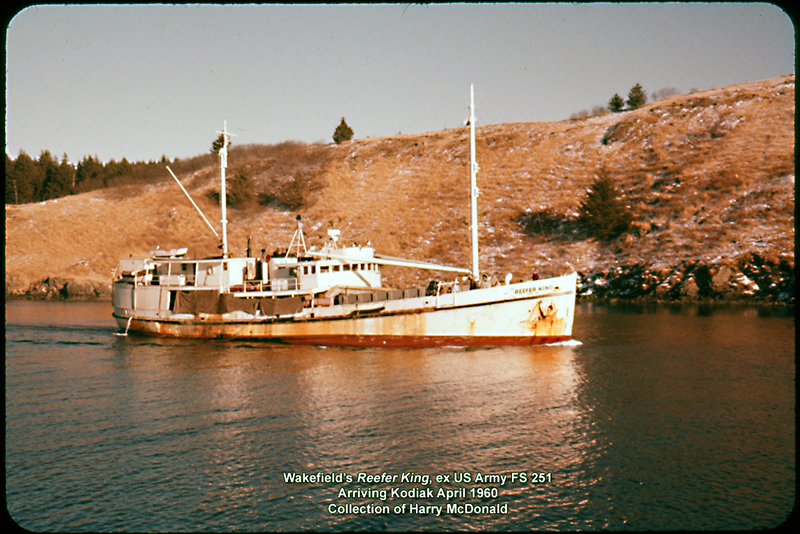 The crab fest that Kodiak Islanders staged that day set Captain Wakefield to dreaming about the commercial possibilities of King crab. His family had been casting about for something to give their herring fishermen year-·round employment. The huge, spiderlike crustaceans average four feet from tip to tip and from 10 to 13 pounds in weight, but giants measuring six feet and weighing from 20 to 25 pounds are not uncommon. The meat yielded by their claws and legs is delicate in flavor, yet surprisingly tasty. It can be separated from the shell more easily than the meat of most crustaceans. Prior to World War II only Japan's far-ranging fishermen showed any interest in exploiting the King-crab fishery. 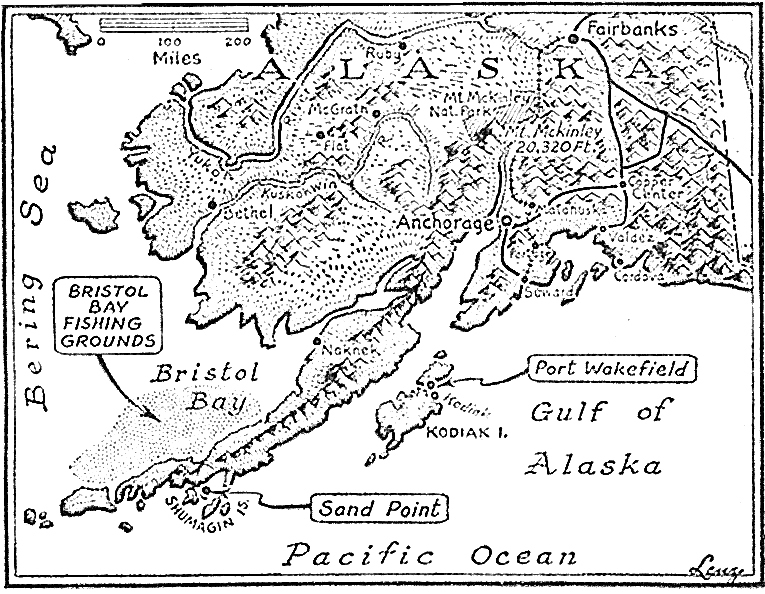 During the '30's Japanese high-seas canneries were processing the Bering Sea delicacy and distributing the canned product to worldwide markets. 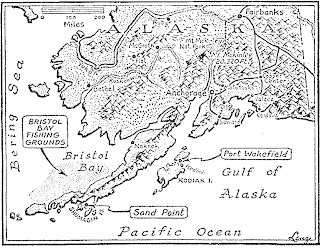 In 1940 and 1941, the United States Fish and Wildlife Service conducted an exploratory study which indicated there was great promise for a King-crab fishery in Alaska. Stimulated by this information the Wakefields were experimenting with methods of catching and processing the crab when Pearl Harbor halted both Japanese and American fishing in the area. The first boat which the Wakefields had built for King-crab fishing - the 38-foot Prospector - was soon taken into government service. By that time Lowell Wakefield had decided to freeze the crab and market it as a frozen rather `than a canned product. King crab, he found, is especially suitable for freezing. It retains its bright red-and-white coloration without fading and resists dehydration and texture and flavor changes. In 1946 he formed a new company, Wakefield's Deep Sea Trawlers, Inc., which eventually absorbed the family company, Wakefield Fisheries. The new enterprise was financed through the sale of stock and a Reconstruction Finance Corporation loan. Most of the capital went into construction of a140·fo0t steel trawler, the Deep Sea, which was outfitted to serve as a seagoing freezing and processing plant. 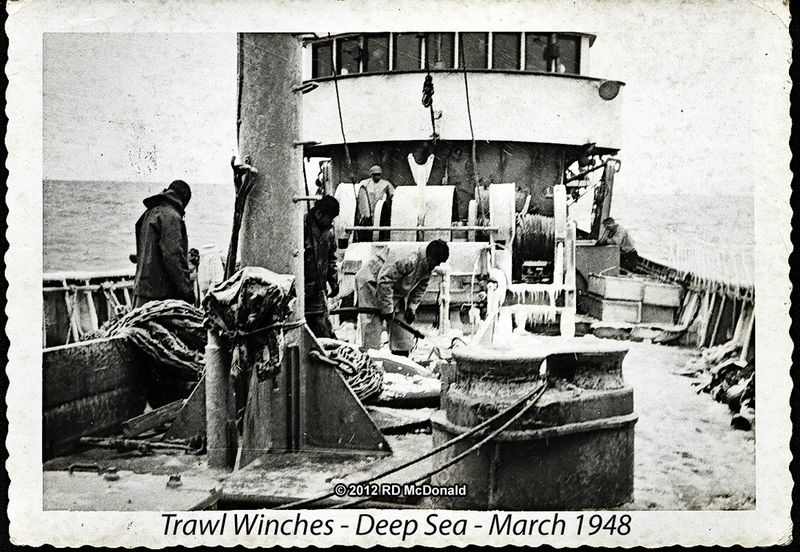 The Deep Sea was modeled after the North Atlantic offshore trawlers, which are designed to withstand rougher seas than the usual Pacific and Alaskan vessels. Equipped to haul the huge crab nets, it employed wartime perfected radar and sonar to help find the elusive creatures. 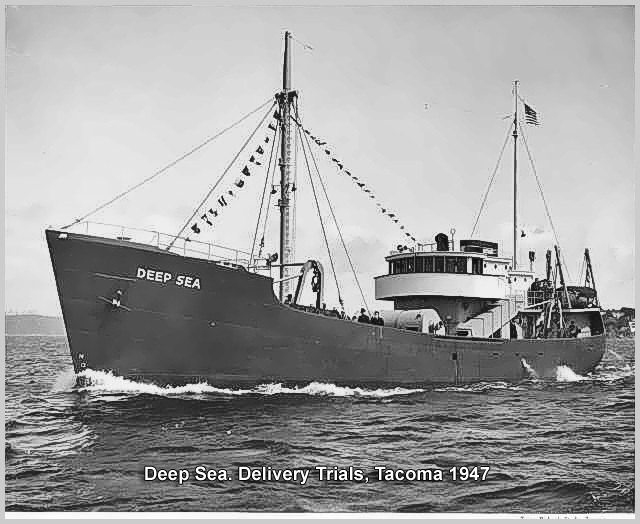 The `Deep Sea was said to be the costliest American fishing vessel ever built and the first one underwriters insured for winter voyages in the Bering Sea. As the operation grew and other boats were needed, the Deep Sea emerged in her present role as a mothership, processing the catches brought to her by smaller vessels. 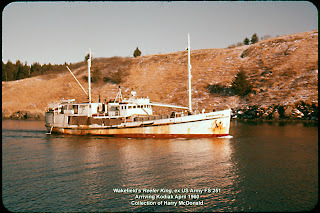 A second mothership of similar size, the Reefer King, formerly used for freezing salmon, was reoutfitted and added to the Wakefield fleet in the summer of 1959. Each mothership carries a¤ crew of about 30 men and can process 3,000 to 3,500 crabs a day. They can each store 200 tons of frozen crab meat. The crews work for a combination` of wages and share of the catch. Once a ship is loaded she hastens to the nearest shore-based warehouse. 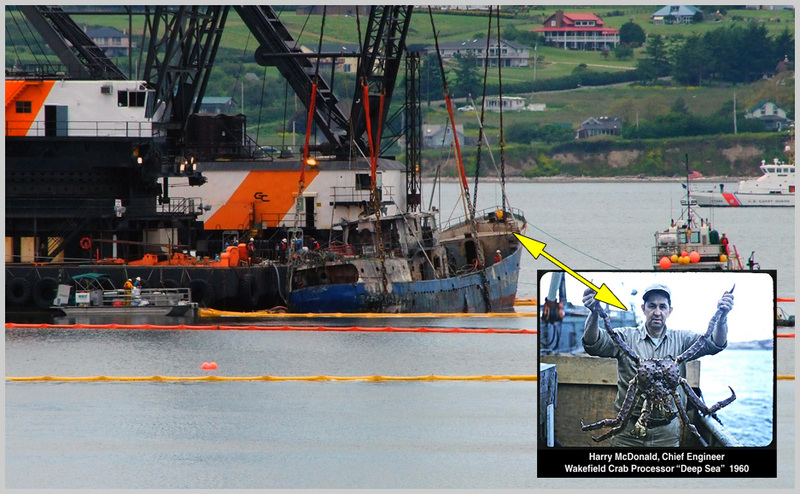 These vessels cover pretty much all of the King-crab areas at one time or another, Mr. Wakefield said. The Japanese reentered the Bristol Bay grounds in 1953 and the Soviets came in for the first time in 1959. Although the Japanese are expanding their fishing fleets, they have promised not to increase their take of King crab, according to Mr. Wakefield. So far, he added, it is the opinion of biologists connected with the International North Pacific, Fisheries Commission that commercial fisheries are not yet harvesting more crab than they should from the point of view of conserving the resource. In addition to the two floating plants, Wakefield's now operates two shore processing plants, one at Port Wakefield in the Kodiak Island area and the other at Sand Point in the Shumagin Islands. The first it owns and the second it leases from the Aleutian Cold Storage Company, which has the distinction oft being United State's most westerly cold-storage plant, actually being situated farther west than Hawaii. It takes a fleet of 40 to 50 fishing vessels, operating under contract, to keep the four processing plants busy and the company's far-flung customers satisfied. About 90 per cent of the fleet is Alaska-owned; the rest are Seattle vessels. Refrigerated coastal steamers, chiefly Alaska Steamship vessels, transport the frozen cargoes to Bellingham, Washington for fina1 packaging and distribution. what wonderful photographs-thanks for bringing to life the background and history of a boat burning that would have been ordinary, if not for the dangers of the mussel industry on Whidbey Island. To delve into the background of the birth of a huge livelihood for so many Alaskans and West Coasters. Cant wait for part two. I know you were pleasantly surprised to know that your Dad was involved with the history of the ship. Looking forward to reading part two of an amazing story of the history of the Alaskan King Crab fishery. Did not know it was that risky of a job. 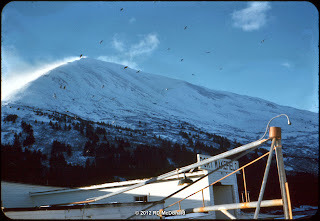 I worked on the Deep Sea in Akutan as a crab processor in 1978. We were processing Tanner Crab at the time. Once in a while we would process King Crab. I remember once a Japanese Ship came in and some boarded the Deep Sea. I am not sure if they were just touring our processing facilities or doing business. We did get some cigarettes from some of their crew. I was one of 4 women on the boat. I have some pictures of my time on the Deep Sea. I have fond memories of my time there. Thanks for sharing your Dads story. I just found some pictures I had taken while working on the Deep Sea in 1978. 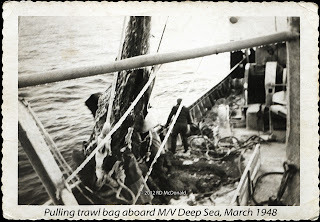 I worked on the Deep Sea in Akutan as a crab processor in 1978. We were processing Tanner Crab at the time. Once in a while we would process King Crab. I remember once a Japanese Ship came in and some boarded the Deep Sea. I am not sure if they were just touring our processing facilities or doing business. We did get some cigarettes from some of their crew. I was one of 4 women on the boat. I have fond memories of my time there. Thanks for sharing your Dads story. I worked at Port Wakefield in the autumn and winter of 1965, then, had to join the air force during the Vietnam push. If things had been different, I would have stayed on to help move the factory to Port Lions. The move was necessitated by the difference in elevation of Raspberry Island after the 1964 earthquake. the geological change had lowered that portion of the northern islands between 5 to 10 feet and the consequence was that at extreme high tide the water was above the dock and also running into the processing plant and all the electric conduits. Adrenaline Rush on Hauser Way!